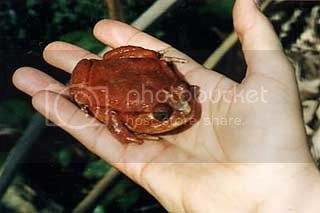 Tomato frogs live up to their name by posessing a vibrant, orange-red colour. Females are much larger than males and have brighter tones of red or orange on their back, with a pale undersurface; some individuals also have black spots on the throat. It is thought that the brilliant colours act as a warning to potential predators that these frogs are toxic; a white substance secreted from the skin acts as a glue to deter predators (such as colubrid snakes) and can produce an allergic reaction in humans.